In Berkeley Springs, the Morgan County Public Library is up against the wall. It’s yearly budget is a mere $115,000. But there is a shortfall of about $40,000. Connie Perry is the President of the Morgan County Public Library. Why did the County Commission renege on its agreement? The funds need to be raised to keep the doors of the library open. 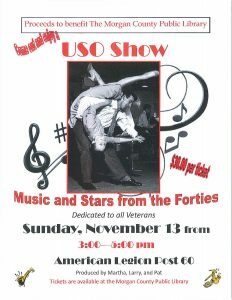 To raise funds, the library will be holding a benefit USO Show featuring music and stars from the 1940s. It will be Sunday November 13 at 3 pm at the American Legion in Berkeley Springs. “The County Commissioners should support the library more because the people want and support the library and they have shown that time and time again,” Perry said. Perry runs a real estate company in town and says that retirees and people looking for second homes are driving the residential market in Morgan County. She was also involved in the deal that brought the new Tractor Supply store to Morgan County. Perry says in the past, she has been involved in talks with Wal-Mart. Perry said her understanding is that when the new Sheetz opens on Rt. 13 and US 522, the old Sheetz on Route 9 and US 522 will remain open.